What a cute looking pollen…until it covers the yard. I’m lucky. I don’t really suffer too terribly from seasonal allergies. I notice the car or patio table lightly dusted in a shade of green, but really haven’t given it much thought. There is something in the air in July that makes my nose itch like the dickens but besides that, I really don’t have any problems. And, really, I have not been all that sympathetic to those who do suffer. My daughters will testify to that. Take a look at the pollen in my yard and on the patio. I came home from work yesterday and–as is my evening habit–went outside to survey the garden beds. Are the astilbe, hosta, heuchera and black eyed Susans I transplanted over the weekend holding up under the nearly 90 degree heat? Are the new ferns I planted adapting to their place beneath the tree? 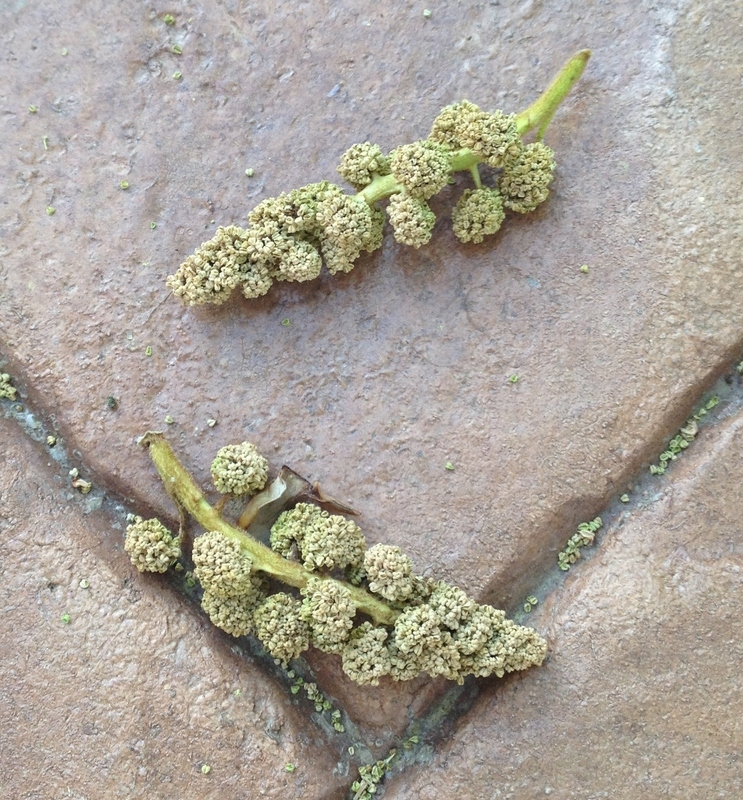 But wait, before I could even begin to answer these compelling questions, I was stopped dead in my tracks by the plethora—and I do mean plethora—of Christmas-tree shaped pollen grains from my neighbor’s sweet-gum (Liquidambar) tree littering my lawn and patio. Those who know and love me know that I am not a fan of the sweet-gum tree. And Arch City is full of them. The sweet-gum is the tree of choice in my neighborhood. No doubt a builder’s special in the 1950s because they are everywhere in my mid-century-built subdivision. 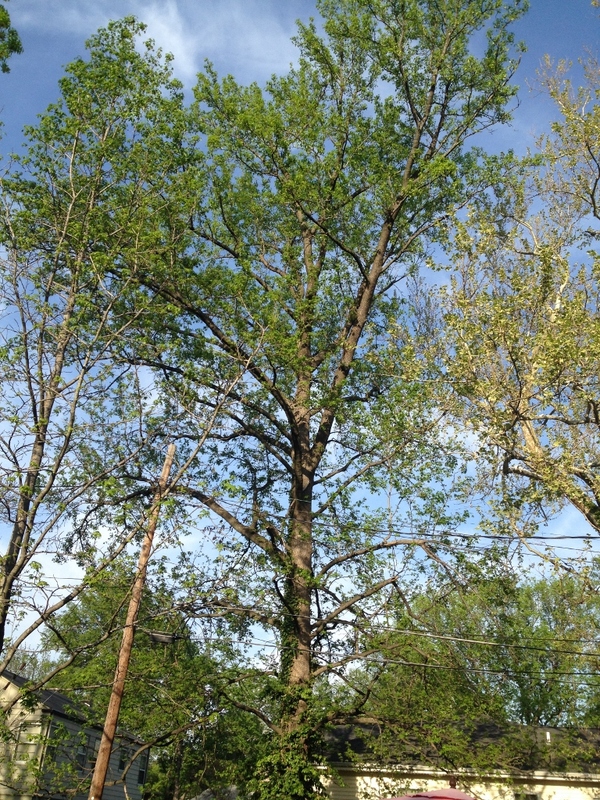 In fact, my backyard neighbors’ has a towering sweet-gum in their yard right next to a 100-foot sycamore. A sweet-gum will grow up to 100 feet and by the looks of it, my neighbor’s tree has accomplished this height. By the way, both trees drop fruit, a spikey gumball in the case of the sweet-gum and one-inch balls in the case of the sycamore. Sweet-gum trees abound in my neighborhood. This one towers over my yard. At maturity, they can be 100 feet tall. I think this one is mature. 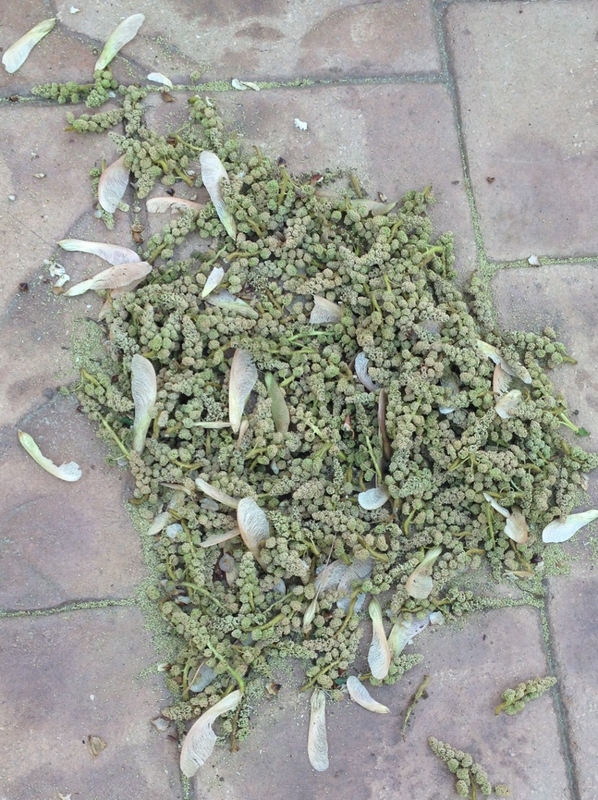 I commenced sweeping the Christmas tree pollens up from the patio. And as I did, they began to break down and the patio looked as if it were littered with yeast. I decided to do a little research and visited pollenlibrary.com (who knew?) where they describe this yard menace as a mild allergenic. To add insult to injury, the two smallish maples in my yard and in the yard of my neighbor to the south, have released a profusion—and I do mean profusion—of winged beans. I know you know what I’m talking about. Don’t ask me what kind of maple these are, because I have no idea. And these winged beans are a moderate allergen. Winged beans from the nearby maples fill the gutters. Oh joy! The forecasters warned that we would have a robust pollen season. Clearly they had this forecast spot on. Now that I’m becoming more sensitive to my friends and family with allergies, I can’t help but think I might have the sniffles. Oh, and a little cough too. How’s your spring shaping up? Categories: Musings | Tags: allergies in St. Louis, astilbe, black-eye susan, heuchera, hosta, pollen, sweet-gum tree, sycamore tree | Permalink.